Artists in general can show us ourselves, our culture, our society in revelatory ways. Writers tend to work in a medium that requires more of the audience than other art forms; more time, more consideration, more reflection. I certainly believe in the potential of the writer to do these things, even the obligation. 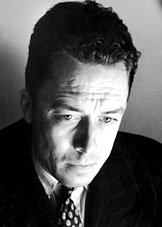 With such a vast expansion of media and forums for expression since Camus's era, I wonder though just what affect that has had on the purpose of the writer.